Whether you have a cat or dog or you are planning to get one: here you can find some inspiration or confirmation for your experience. I am going to speak about the pros and cons to have an animal living with you, what you can expect and what you can’t, what you can do in moments of difficulty and challenge and how you can grow yourself by taking care for an animal. Do you love cats? 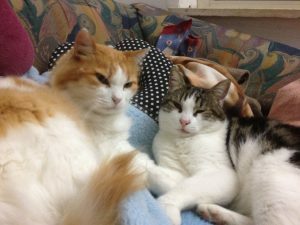 – Here some true stories of my 25 years with cats. People say that cats have 7 lives -are you sure? What happens when your pet family expands? I love the story about your cats. I used to keep cats too many years ago. It was mostly one or two at a time so I did not observe if they had a proprietary behaviour. I can only imagine things would be much different if I had more than 2 pets. Btw, your cats look really beautiful and well cared for! Thank you Yvonne, for your kind comment. Living with a one or few cats only is beautiful, too, but you don’t have the chance to watch the systemic way of how they sort out the group position and hierarchy. It is fascinating! Thanks for your great comment. As an animal lover you certainly can appreciate the stories which arise out of the experience of living with these lovely creatures. If you have a story to share, more about cats than dogs – or about them together, you are welcome to do a guest blog on my site! Your cats are so cute. I am a very long time cat owner too. Nowadays I just have two cats – both pedigree ragdolls. Dyson is 6 years old whilst Callie is brand new and 15 weeks old now. It was interesting to watch them interact with each other and sort out their pecking order. Previously I had 4 cats at one time (sadly they have all died now – lost the final one last year at 19.5 years old), that was a little more fraught on occasions as two of them didn’t like each other. Hi Evie. So good that you can enjoy the 2 cats of yours! And I know how it feels when an animal comapnion dies, it is a big loss. In my experience, those cats with which you have a very close relationship, they will stay forever in your heart, even when they have passed. It is very much so for me with Tommy, who died 2 years ago. I will write about him and our relationship very soon. He is still vividly alive in my inner world.